Today is considered to be ‘Constitution Day’ and is sometimes called ‘Citizenship Day’ for the USA. The current Constitution was adopted on September 17, 1787. Typically, this day is not really celebrated in the USA. Yet, those who live in the USA may wish to re-read its Bill of Rights which came into effect as Constitutional Amendments on December 15, 1791. The Bush Administration got Congress to approve the so-called ‘Patriot Act’ and establish the Homeland Security Administration and other offices. The Obama Administration has added other offices as well and when its healthcare law goes more into effect, it will also create a lot more New Offices, etc. Citizens of the USA are not truly free and are spied upon all the time by its government. The USA does not truly abide by its Constitution any more. And its hypocrisy and tactics are being noticed by others, and the coming Beast will follow further along the espionage path that the government of the USA has been laying out. Because of its espionage, the USA is helping push Germany to eventually start WWIII (see also World War III: Steps in Progress). There are many negative ramifications to what the USA has been doing. This entry was posted on Wednesday, September 17th, 2014 at 12:01 am	and is filed under Prophecy. 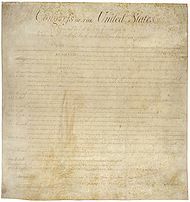 USA Constitution and Citizenship Day: Which ‘rights’ have been disappearing? More Loss of Rights in USA?